Love is like that. Back in graduate school, every so often, I would be woken up by a squeal of elation coming from down the corridor as quiet hours were thrown aside. Without opening my eyes, and perhaps turning to the other side of the bed, I would know someone had gotten engaged. That early morning squeal equated with engagement. Something interesting happens after you get married. Similar to that unspoken assumption of mine in graduate school, words like “big news” or “surprise” evoke the next expected rite of passage. Things I did not realize about marriage before diving into it include the fact that just as each person is so infinitely different so is each couple. Our happiness is different from the couple across the hall’s happiness. Ours includes an hour of uninterrupted writing time when we get home from work. So what happens when one of you is writing daily and diligently, while the other is stymied? Take a walk. Settle your body into downward dog. Listen to Mumford and Sons. Call a friend and catch up. Be quiet and listen to the birds squawking overhead. Get out of your rut by getting out. You know that sentiment of looking for something and not finding it only to later discover it was in front of you all along? Sometimes, we look too hard. We fixate with such intensity and fervor. There is much to be said about looking outward. In the looking out, you might just find what you were looking for. 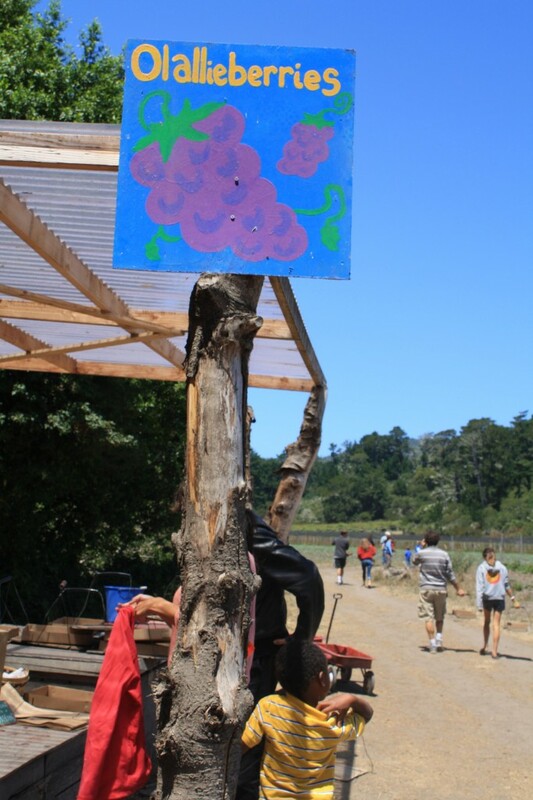 A few weeks ago, we ventured to our favorite U-Pick farm in the outskirts of Pescadero. 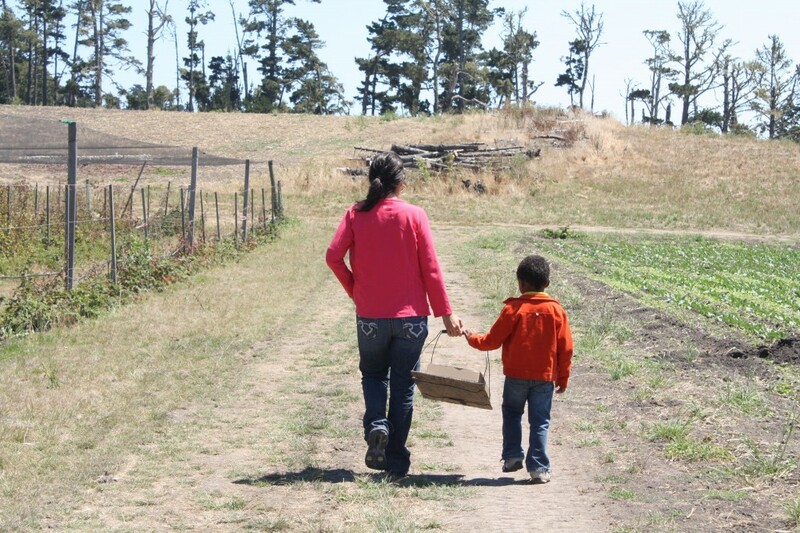 This farm, these olallieberries were too good to not share with Erika and her little one. Thus, a few hours before her flight was supposed to shuttle out of the Bay Area, we made the trek. Little hands ripped berries from their branches. Tall adult figures bent down to reach under leaves and find plump juicy ollalies. We left with a pound of precious berries. They sat there, on my counter, in that long cardboard flat looking positively joyous with possibility. I could make jam. I could make syrup. I could make a compote to spoon over yogurt. I could make hand pies. I could make rustic tarts. You get the picture. I was overwhelmed with possibility! Macerating in the fridge, I bought time and continued to consider the options. I left the berries in that bright red bowl in the fridge, checking in on them with the attentive concern of a mother hen looking in on her chicks. My brow continued to furrow with concern of time passing, of losing my window and ultimately losing berries hand-picked by my cousin Erika, her little one, Beck and I. That shared act of love necessitated that they not be taken for granted. It’s an odd idea perhaps, to take food for granted, but I would surmise that food that’s easy to pick up at a store carries little personal investment outside of the monetary. What I had here, was the remnants of our last afternoon with a cousin I see too infrequently and time with her son who will continue sprouting up and deeper into the throes of childhood. I decided to follow my usual path of creeping out of writer’s block to work my way out of ollalieberry block, and wouldn’t you know, Marisa’s recipe that Friday held the kernel of inspiration I needed to part with some of the berries. 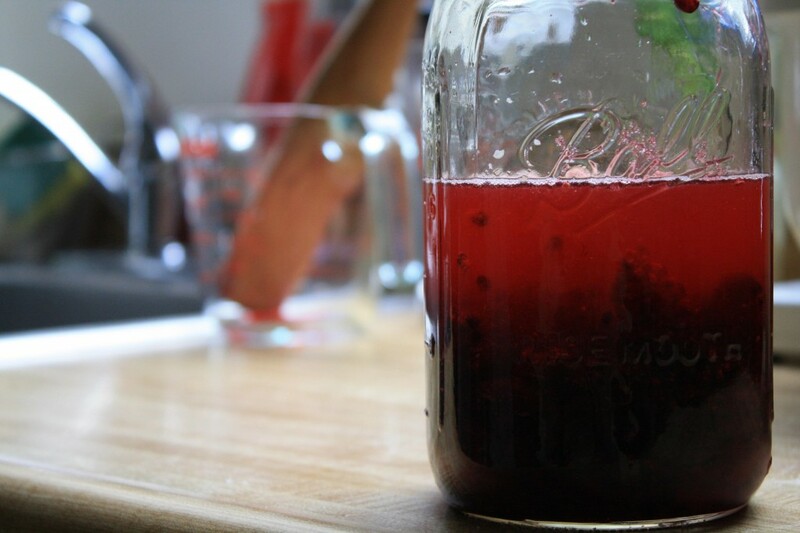 And so, friends, I give you a recipe for an Olallieberry Shrub. Hear me, those of you not prone to sour foods or drinks, a shrub is not for the faint of heart. It should make your mouth pucker and the sweetness should make the tip of your tongue tingle in delight. If you drink Kombucha, then you will be in fine company, drinking a shrub. If you want a clean drink without any pulp, by all means, strain the mashed berries from the liquid. 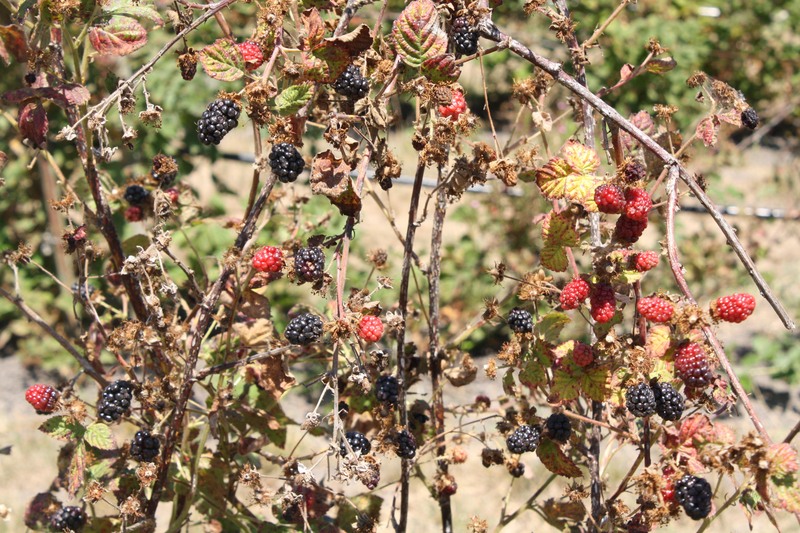 As for me, I chew those berries and remember a sweet afternoon in Pescadero, enrobed in sunlight and spent with people I love deeply. There’s nothing sour about that. A lovely way to enjoy your homemade shrub is with sparkling water, just make sure to pour to taste. If you want to kick it up a notch, how about including it in a cocktail? You can also use it as the acid in a salad dressing or as a marinade. Your choice. Not feeling like making your own shrub? I can vouch for the smooth, tart and sweet flavor of the Wild Elderberry Shrub from the folks at Wineforest Wild Foods in Sonoma. They gave me a bottle at a blogging conference a while back, along with delightful conversation about the joys of foraged food. The ratio for this recipe is 1-1-1-easy. 1. Rinse your berries in a colander. Then pour the berries into a quart jar. 2. Over them, pour your sugar and vinegar. Now, mash the berries with the help of a muddler or some contraption that fits into your jar and a blunt end to make quick work of berry-mashing. 3. Place the quart jar in the fridge and leave it for a few days, to let the ingredients combine. You want to make sure the sugar has completely integrated is integrated in and no longer granulated. Annelies, what a delight. 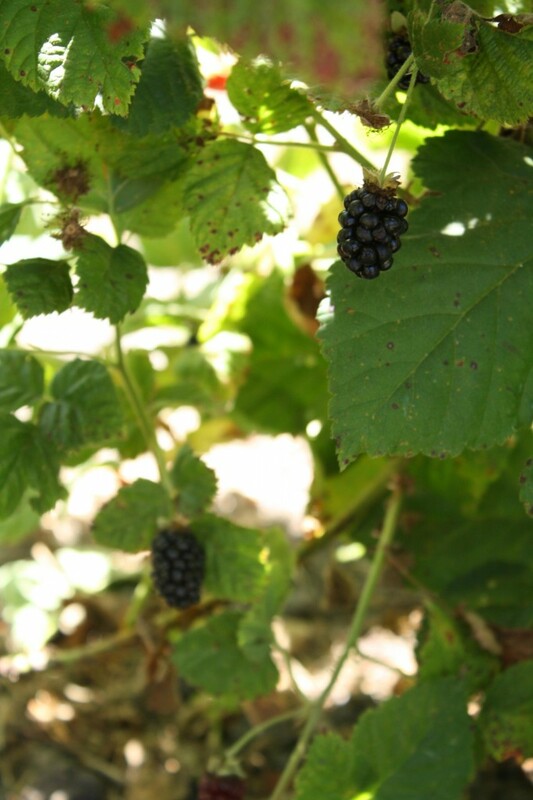 I googled olallieberry shrub and found you and your blog! The internet done right. Thanks for this! I hope you are well and thriving.